As the holiday approaches we know that so many of our campers, staff, alumni and their families are gathered with their families and friends. Whether you're spending the end of the year at home, somewhere tropical, or skiing out west, we hope that you'll take a few minutes to check out our latest newsletter. We've got lots of news, including our first batch of counselors who have signed on for the summer or 2013. This is just the first of many newsletters previewing the great staff members that are going to make this upcoming summer so great! To get to the newsletter, click the Siren, or this link. 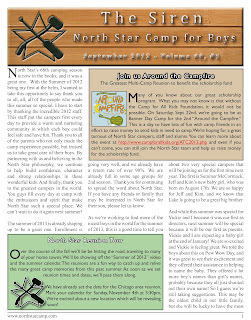 We'll have another newsletter out soon to detail even more staff and campers that will be at North Star in 2013. 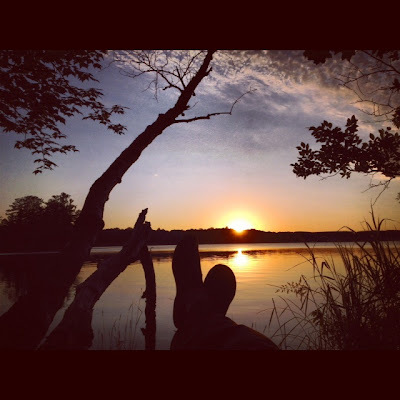 I have spent the past eight summers at North Star, an overnight camp for boys. At camp, activities are structured to foster intrinsic motivation and reward campers for personal achievement. For example, North Star does not have archery competitions. Instead, the camp challenges campers to reach various point levels. Because campers don’t feel pressure to outperform each other, they are able to focus on their own development and experience the pure joy of mastering a new skill. Two years ago, I became a counselor at North Star where I work to foster and preserve this sacred tenant. 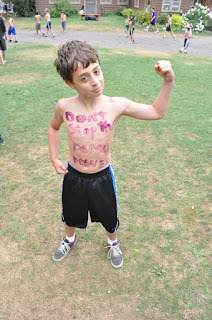 As a counselor, my responsibility is to redirect a camper’s energy to self-competition. I have learned that by focusing children on themselves, they gain individuality. Camp is so special because all campers are accepted. The trees surrounding the campgrounds truly form an impenetrable barrier to the outside world. As a result, each camper has his own barrier of trees protecting him from outside pressures. Camp creates its own community, and everyone tries to take home a piece of it with them at the end of the summer. Camp is an integral part of my life; it has given me the confidence to explore various subjects in school. While tracking my exploration and self-progress, I realized that I excel and enjoy math and science. In high school, physics and calculus became interesting to me, and these subjects are a strong foundation for a career as an engineer. I have experimented with computer programs and want to learn more and create my own programs. I love videogames and want to learn how to create their graphical systems. Due to my fascination with technology, my interests gravitate towards computer engineering. Because of camp, I now have deep roots that support the branches of my personal ambitions. What school could say no to this?! I’ll never forget my final Key Log ceremony. The campfire was raging in front of me, the small stick of wood was resting in my palm, and the reflection of the sunset was glistening across the lake, illuminating the entire Council Ring with its orange glow. As I’d been dreading, a lump formed in my throat. I was sure going to miss this place. For eight years as a camper and counselor, I’ve chosen to spend my summer at North Star Camp for Boys. At first, my decision was primarily based on how tall the climbing wall looked to a nine year old and the fact that my dad is an alumnus, but I had no idea of the effect that North Star would have on me. Maybe it was the friends I made over the years, or the counselors’ guidance, or even the disagreements that spring from ten pre-pubescent boys living in one cabin, but after each summer ended I was the first to sign up for the next one. We have a special tradition at North Star, where every Friday night, each person gets an opportunity to thank someone else for doing something nice. The last Friday night of my last week as a camper was eye-opening. I stood in front of the entire camp, voice cracking as I held in my emotions, but I wasn’t embarrassed or nervous; I felt welcomed, even as I was saying goodbye. It was then that I realized what this camp had given me: another family. The summer at North Star is about as beautiful as it gets, but fall at camp is right up there. Check out some of the Pictures from my recent trip up to the Northwoods. The September Siren is Online! Around the Campfire this Saturday! It has now been a month since we closed down camp and it is time for two very important things. The first is to share all of the news with you that has taken place since the buses left camp, and there has been a lot happening. We had a great Post Camp, the Summer of 2013 is filling up fast, our staff has dispersed around the world and has lots of news to share, and we have been doing some major renovations to the camp facilities. You can read all about it in the September Siren! The second thing that it is time for is to get together again! Coming up on Saturday, September 22nd, we will be having our second annual Around the Campfire reunion at Banner Day Camp in Lake Forest, IL. It is shaping up to be a great day for all. We will be gathering at Banner at 2pm and all campers, staff, parents, siblings, and alumni are encouraged to attend. From 2pm - 6pm we will be having a fun filled day where we do our best to recreate camp. It will be a great opportunity to see your camp friends and get in one last gasp of camp before summer fades away. The afternoon will conclude with a barbecue dinner as well. Then in the evening, we will be reconvening at DC Sarnies in Deerfield. The Alumni After Dark event will be a great chance for any alumni to get together, reconnect and reminisce. We look forward to seeing you all on Saturday! Chicago Reunion - Save the Date! Mark your calendars for Sunday, November 4th at 3:30pm. That is the date of the North Star Chicago Reunion. A brand-new, exciting location is in the works for the reunion, so stay tuned for the announcement. We are looking forward to seeing you then! The September 1st Deadline is Tomorrow! We hope that you will join us again for the Summer of 2013. This is the final day to guarantee that your son ca! We know that it is early, but once the deadline passes, we are going to open any available spots to our new campers on the wait list. In some age groups, we believe that there will not be any openings. We have twice as many registrations in today as we did at this point last year, and twice as many from new campers. ENROLLING NOW IS THE ONLY WAY GUARANTEE YOUR SPOT. Please don't wait! This is our way of protecting our returning campers. After September 1st may be too late in many age groups. You can Register Online at www.NorthStarCamp.com. If you have any questions, please give us a call up at camp at 715-462-3254. We are looking forward to a fantastic Summer of 2013, our 69th camping season at North Star, and we hope that you will again join us. As summer turns into fall, we have a great opportunity to rekindle the North Star spirit in Chicagoland and to support the camp scholarship organization Camp for All Kids at the same time. On September 22nd, there will be the 2nd annual “Around the Campfire” event, hosted by Camp For All Kids. Last year, Around the Campfire hosted more than 400 campers, family members and alumni from all five participating camps (North Star, Birch Trail, Chippewa, Kamaji and Timberlane) and raised more than $125,000 to support Camp for All Kids. This year we’re throwing another reunion on Saturday, September 22 from 2-6pm on the grounds of Banner Day Camp in Lake Forest, IL. This is going to be a great family-oriented event highlighted by mini reunions for each camp, an all-new live auction for all ages, BBQ dinner and s'mores around the campfire. Afterward, join us for Alumni After Dark, an adult reunion for alumni and their guests. There will be complimentary hors d'oeurves and a cash bar. The fun starts at 7 pm at DC Sarnies in Deerfield, IL. It’ll be an afternoon and evening that combine the spirit of camp with a collective effort to send deserving kids to camp. Camp for All Kids facilitates racial diversity by providing scholarships to kids from under-served communities so they can attend North Star or one of the other four partner camps. We’ve simplified the fundraising this year. Join the North Star team and create a personal fundraising page so your family and friends can donate to this life-changing organization. You’ll earn points for each dollar raised that can be used in the auction on September 22nd. Auction items will include camp-specific experiences and prizes...it will be fun and rewarding for all ages! And while we hope you’ll start your own fundraising page, you also have the option to simply purchase tickets for the daytime event, evening reunion or both. Visit the Around the Campfire website to join our team, donate, or purchase tickets. Come to Banner Day Camp and Sarnies, see your buddies and have a great time. Please save the date and give generously. We hope to see you on 9/22/12. Today was the first day of the “off-season.” Camp is quiet and the deer have moved back in to graze on the athletic fields. Aside from the surprise of Mack and Murphy chasing them away, they also found a field in the process of being totally renovated. Yesterday we began a major project to grade and irrigate the athletic fields. It started with a local farmer tilling up all of our current turf. Then today, Dan and I went through and picked out the rocks. Tomorrow, they will begin the process of installing a sprinkler system that pulls the water from the lake and keeps the grass lush and green. Finally, the head greenskeeper from one of our local golf courses will be overseeing the planting of the perfect grass blend for our athletic fields. Post Camp just drew to a close yesterday. We had a great week with families who joined us from around the country, many for the first time and some who have been coming for over 50 years. John Sheehan, Andy Rodheim, Scott Goldberg, Ben Mizel, Olly Cayless, Lewis Mulvee, Jeremy Palgen, Matt Rixon and Ben Lamont stayed on to lead post camp and help clean up camp, and we heard story after story of what a fun and meaningful summer it was for all involved. We have been hearing from campers and parents alike who are saying the same thing. That sentiment is being reflected in the enrollment for 2013. We have more than twice as many registrations today as we did at this point last year, and we already have many people on a waiting list for second session. We want to reiterate that WE CAN ONLY GUARANTEE PLACEMENT FOR RETURNING CAMPERS IF YOU ENROLL BY SEPTEMBER 1st. Please don't wait! This is our way of protecting our returning campers. After September 1st may be too late in many age groups. If you have a younger son that is interested in coming to camp next summer, please enroll him before September 1st as well. And if you have any friends or family that may be interested, please let them know that they should be in touch quickly. You can also fill out our Refer-A-Friend Form online. Most of all, we want to thank you for trusting us with your sons. We often boast that we have the nicest campers in the world, and we mean it. So thank you for making the decision to have them spend the summer with us. We look forward to many more. Its hard to believe that we're entering the last week of our summer. As we do so, we really get rolling with our special programs. Over the last week we've had our Green-White Egg Marathon the Lumberjack World Championship were just a few of the great all-camp activities that have pushed us towards what is a grand finale. As we come down the stretch, we go into overdrive with special events, with Pow Wow Day being a camp staple. This year's Pow Wow Day was no exception. On Sunday, after returning from the Lumberjack Championships we announced the captains who would lead their teams. The captains are charged with lots of responsibilities as they assemble their teams, assign the members and work to ensure that everyone has a great day. They help to build the spirit and sportsmanship that is vital to a great Pow Wow Day. Our tribes this year were Cocopah, Pomo, Totonac and Wallawalla. As the day approached, each team had to show their creative sides, performing cheers on the two days prior to Pow Wow Day. What was once simple songs and rhyming verses have been transformed into elaborate song parodies that would make Wierd Al proud. We have begun to afford each team some time ahead of the cheers to teach them to their entire team, ensuring top notch (or near top notch) performance. Each Pow Wow Day we wake up half an hour early to make sure that we can get all the days events in. The teams choose colors, so we give everyone time to get painted for the day, and then we go into opening ceremonies. On horseback, Leb led the four tribes silently towards Lou's Diamond, with each tribe forming a line between the bases in one large square. This is a camp tradition, but this year's opening saw him hand off his head dress and the Pow Wow Day Peace Pipe to Andy, who was also on horseback. After our opening, under some light drizzle, each village went into their leg wrestling matches. Its hard to beat the energy and enthusiasm of this. With their teammates cheering them on, the wrestlers work to flip their opponents, with a handshake after the match, regardless of the outcome. The rest of our morning events went off without a hitch. Lunch is another great camp tradition... the silent meal. Everyone enters the lodge, and after grace, there is to be no talking as everyone enjoys their meals. Scores at lunch were tremendously close, with only ten points separating the 1st and 3rd place teams. The afternoon began with our staff 1-pitch softball game. Not only is honor on the line in this game, but so is food. The outcome of the games determines the eating order for dinner. Running relays and tug-o-wars followed lunch ahead of the third and fourth series. Third series has lots of water event. There are several canoe events and the fishing contest. Fourth series sees the entire camp head down to swim point for swim races, log rolling and water polo. 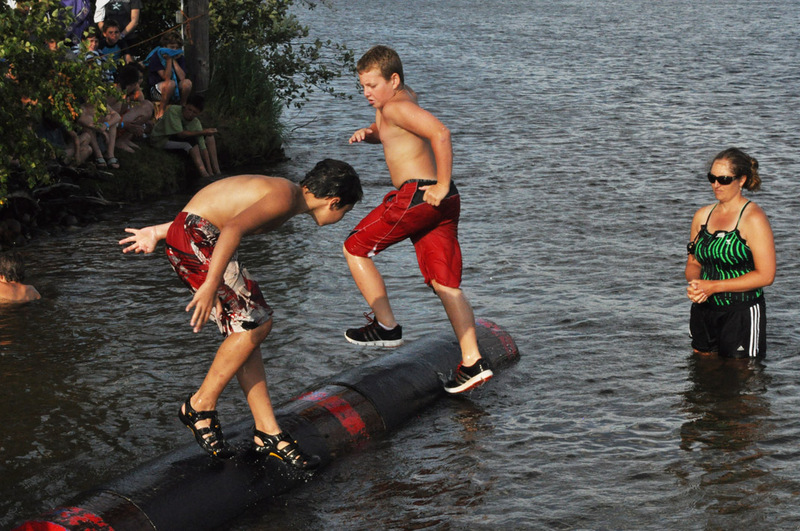 One big change to Pow Wow Day this year was with log rolling. In past years, each tribe had two log rollers that hopped onto the log solo and we timed how long they could roll. This year we've had members to the Hoeschler family at camp teach our campers how to log roll. They have won several log rolling contests and have done a great job teaching our campers the sport. The change to this year's contest saw log rollers going at it with an opponent on the other end of the log, and the first to fall twice was out. Following a great dinner we have go into the announcements of the scores (It Just Doesn't Matter!). Campers are eager to know how their team did, and often they just can't contain their excitement. Somehow a 5 minute announcement is strung into an hour long stall, with our campers as willing accomplices. Campers spent at least ten minutes giving Andy and Vickie many recommendations for baby names. In the end Totonac, who had been in second place at midday had a great afternoon to win the day. While we are in the home stretch of the summer, about 20% remains for our second session campers. We've got espionage, camper counselor day, casino night and several other highlights ahead! Each summer, there comes a point as we near the end of July where we turn up the heat and our "regular days" start getting filled with more special programs. Our regular days allow campers to really focus on their activities and get settled into a groove. We've hit that point for the summer of 2012 where special programs come left and right. The fun started on Friday following our weekly services at the council ring. As Andy called down those who had been at camp for ten years or longer, a van full of visitors came up honking signaling the Big Ten. The Big Ten is a roast of sorts where we honor those who are spending their tenth summer at North Star. Its quite an achievement to commit that many summers to camp, and for so many of our Big Ten honorees, we've seen them grow up from campers to counselors. The Big Ten is a surprise and very few people in camp know when the day will be, so as staff unroll a banner, the Big Ten guys don't know if its actually the Big Ten or not (we often have fake Big Ten's to build up the suspense). This year we honored counselors Willie Goodman, Andy Rodheim and Andy Stern. All three began at North Star as campers and we're thrilled to add them to the list of men and women on our Big Ten plaque.We had lots of great visitors come up for the Big Ten and we thank them for their efforts to make it to camp this weekend. As Saturday rolled in, so did several "rookies". Each summer we hold two Rookie Weekends. These allow prospective campers and their families to come into camp for an extended visit. While we do tours all summer long, Rookie Weekends allow the parents to get their own tours of camp while the prospective campers got to participate in activities on both Saturday and Sunday. After a Green-White Series on Saturday night, or campers awoke to what they thought would be a normal day. In the midst of morning announcements, Andy walked into the lodge in full lumberjack regalia. After he repeatedly screamed "Yo Ho!" (a lumberjack cheer), constantly interrupting morning announcements, we broke the news to camp that we'd be taking them to the 53rd annual Lumberjack World Championships. 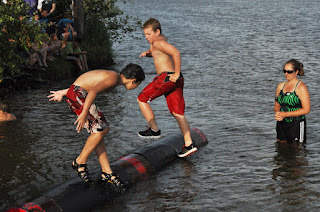 The Event is an afternoon full of competitions in lumberjack and logrolling events. The LWC used to be televised on ESPN. North Star always has an interest in supporting New Zealand native Jason Wynyard, one of the competitors. Jason visited camp a few years ago and showed off some of his tools and put on a display for camp. Jason is tops in the sport and this year he won his 14th consecutive All Around Men's Championship (as well as winning several individual events). The day wasn't finished yet, however. We returned to camp and after dinner we played Glen's Game. Glen's Game is a camper favorite, where there are four areas that campers must get to. Those four areas, however, are heavily guarded by counselors. Campers have to use speed, smarts and other skills to get into a coned area. Once there, they get a mark and then head to another area. Tomorrow is yet another day, and one loaded with special programs. With a regular morning in store, the afternoon will bring the Green-White Egg Marathon. Evening program will be an all camp campfire which will surely feature a talking contest and "I see a baaaar". Our campers were able to persuade Andy to call for a half hour later tomorrow, so we'll sleep in before another great day in the Northwoods! A few days ago Leb's Ramblings featured the kick-off of College Days, a three day event where our senior village is split up into four days. Throughout the week the teams take each other on in a variety of events, mostly of the sporting variety. Over the past few years, however, several non-sporting events have been a part of College Days, events like a card tournament and the trivia challenge. One of the non-sporting events has reigned supreme since College Days' inception; the cook-off. In true Iron Chef style, each team gets a series of ingredients to prepare a meal for the cook-off judges. The biggest difference, however, is that the cook-off is all done over the open fire. At the start of College Days, each team is given a list of ingredients. They then request what items from the list that they want. They have a choice of meat options, starches/carbs, vegetables, and so on. They also request spices and other sauces for their dishes. After quite a bit of behind the scenes work from cook-off coordinator Kim McCormack, the teams pick up their food and get to work. Everything is taken into account. Teams are scored on the obvious things, like taste and presentation, but also on clean-up. Teams prepare appetizers, a main course and a dessert for our judges. Various chicken dishes are the most popular, with chicken parm at the top of the list. Over the years, teams have come up with elaborate items while others have settled for more basic but high quality burgers. Being a judge is quite an honor and there are many requests from our staff to sit on the panel. Some of you may be envisioning your son, a bunch of ingredients, a pan and a fire, and thinking the worst. The food is actually fantastic. While there is an occasional culinary creation that doesn't cut the mustard, the majority of the time the food is great and the seniors have a ton of fun with it. This year was no different. So for the parents of our seniors, we can attest that not only can your son help clean up after a meal, they can also help make it, too! Those of us who have been at camp for more than a few years sometimes have a hard time realizing how long some of our "traditions" have been around. To campers, the concept of "that's the way its always been" often may refer to something that has only been a part of camp for four or five years. College Days is certainly in that category. Some of us were around for the first College Days and at first it seems like something that is relatively new, and while we were discussing it we realized that its actually been a part of our program for 13 or 14 years. 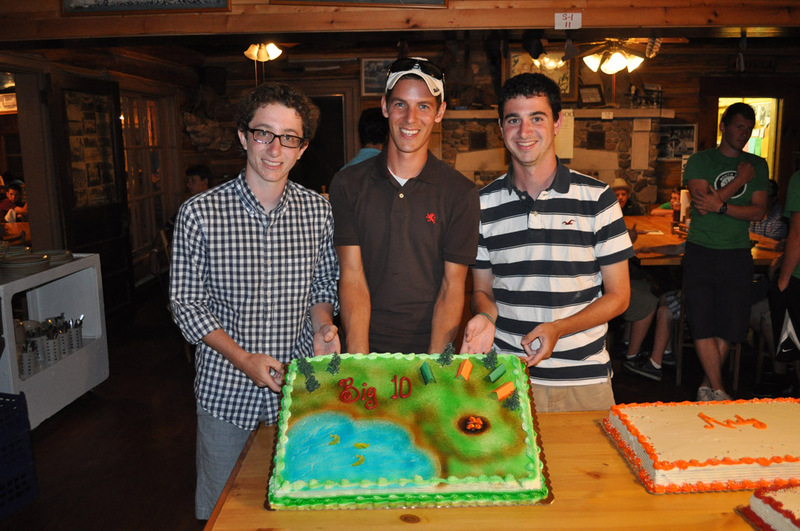 College Days was started in the late 1990's by Senior Village Director Seth Katz. In response to the need for more specialized programming for our oldest campers, a three day series of events was created. During this time, our oldest village does not participate in any of the programs that the rest of camp does, with the exception of meals. From the start of the day until nightfall, our 13-15 year olds have programming exclusively for themselves. From the start of College Days, the village is split into four different teams. There are no captains, giving the team the opportunity to create its hierarchy and allowing the opportunity for many to lead. Each team decides what college they want to be for the duration of the three days. Initially the programming was almost exclusively athletic based, with one main exception, the cook-off (we'll write more about that tomorrow). Over the years, our Senior Village Directors have added their own touches. College Days has seen the addition of a bowling tournament, trivia challenge, team cheer contest and plaque making. College Days 2012 kicked off today with much excitement from the Seniors. They look forward to this all year and it undoubtedly marks one of the highlights of their summer. While in years past some of the colleges chosen were the typical powerhouses, in recent years, the teams have opted for non traditional schools with really fun mascots. This year's teams are Bowdoin (Polar Bears), University of Alaska Southeast (Humpack Whales), Bard College (Llamas) and St Francis Xavier University (X Men). The opening day's activities started with traditional games of softball over first and second period. Post lunch, there each team split up to send participants to archery, riflery, swimming and waterskiing. Football consumed much of the afternoon before teams were given some free time to plan for things like the cookoff, mascot costumes and cheers. The teams participated in a wide ranging trivia contest in the evening, with NSC trivia as well as questions about college mascots, pop culture and general history. Capping off the evening was arm wrestling. While certainly a display of skill, it was an even more entertaining to see all the facial expressions. We'll pass along more updated as College Days progresses but after one day, the Seniors are having a great time! This keylog is for my cabinmates, counselors, cousins and new friends helping make North Star my new home. This keylog is for everyone who makes camp possible, because North Star is the best opportunity I've had in my life. Every Friday night we head out to the Council Ring for our Friday Night Service, a values based campfire program. 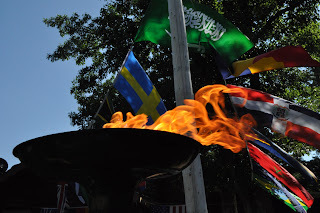 One of the parts of this service is the keylog ceremony, where every camper has the opportunity to throw a stick into the fire and share something he is thankful for. The quotes above are two of the keylogs from this evening's service, and these are just two of the well over 100 keylogs like them that were given tonight. It has been a great first week of 2nd session, and these keylogs symbolize that. Yesterday was our first Cruiser Day of second session, and it was a great one. Cruiser Days (typically Tuesdays) are a cabin day where each cabin group puts together their own plan for the day. The day starts with doughnuts and ends with a cookout dinner over a campfire, with lots of fun in between. 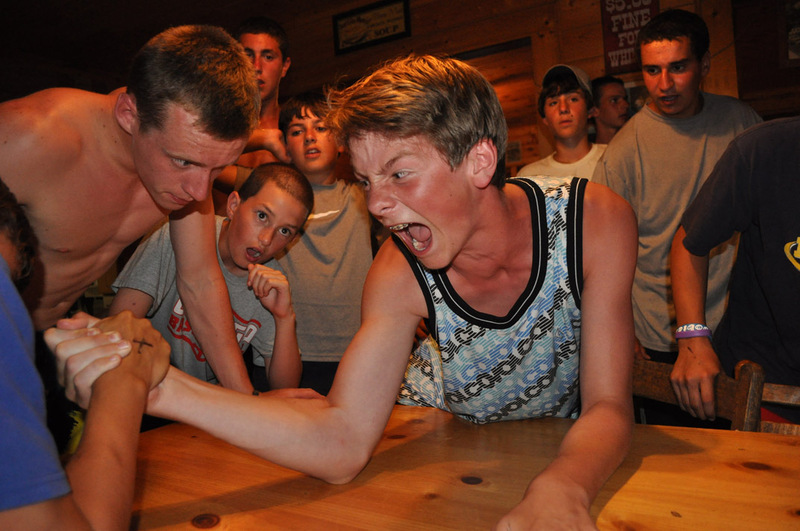 The cabins can choose from all the activities around camp, and they get creative with more as well. Each cabin takes one Cruiser Day as a Village where they go on a field trip together. Yesterday was the Junior Village Cruiser Day, and it was a great one. The boys headed over to the Hayward waterslide and mini golf for a morning of fun. From there the boys headed over to the world famous Hayward Lumberjack Bowl for a show and demonstration. Campers and counselors alike joined in to support their favoirte Lumberjacks with the customary cheer of “Yo – Ho!” After the show, the boys headed to Hayward Beach where they had their cookout dinner. Meanwhile back at camp, the Intermediates and Seniors had some fun of their own. Our Pine Manor campers spent the day hiking at Copper Falls. Many of our campers made up many shenanigans, but none topped cabin S-3 and their Super Hero Day. Each camper picked a super hero to dress up as and they did many activities as their favorite Super Heros. The day ended as everyone prepared their dinners at their campfire sites. Last night’s dinner was Tin Foil Surprise, where you take hamburger patties, potatoes and vegetables and wrap it in tin foil and cook it over the fire. The result is a delicious dinner! And s’mores for dessert to top it all off. It was a great Cruiser Day and we’re looking forward to two more fantastic ones. The first session of year one under the direction of Andy has come and gone and it's an appropriate time to sit back and reflect upon the summer. First of all, this past weekend we had over 150 visitors and they were treated to a beautiful and moving Friday night service. The theme of character building and the camper chorus, counselor chorus, sermonette and of course, the key logs were moving and came from the heart. Many parents in attendance were former campers and counselors with either Sue and myself or Lou and Renee. The comments I heard were how beautiful camp looked and how meaningful the service was. At the end of the program Andy spoke about how unusual it is is for a group of boys to be able to stand in front of a group of over 350 people and express their appreciation and thanks to their parents, counselors and people that meant something to them. It's very true that the community that came together on Friday night.... parents, campers and staff felt part of something very special. The staff that Andy and Dan Lichtenstein, our associate director, put together is fantastic! Every one of them has committed to being part of a community centered around creating a community that cares about kids, that wants to have fun with kids, to be around kids and to make a special place for kids. I believe each one feels that being part of the camp community is special and a place that is bigger than themselves. I believe that if our country and world are to be entrusted to the type of young adults that represent this summers staff, then I feel very confident about "our" future. I believe that every adult that visited this past weekend would concur. Our campers are having a blast! Watching them play games; interact with each other and their counselors; come back from their cabin overnight trips; choose and participate in their favorite activities and get excited about special events such as United Nations Day; espionage and the 4th of July party with Birch Trail has been a lot of fun. This weekend I was asked by a few visitors what it's like to have stepped down from the director and ownership. Some asked if it was difficult. I'll share with you what I said. It has not been difficult at all! I'm loving being able to come and go as I please and to be able to watch a spectacular summer unfold. It is absolute pure joy to watch the kids have fun and love camp as much as they do. And that's the real point! Camp is better than ever! Sue and I are POSITIVE that camp is in great hands. We are sure that North Star will continue as one of the very finest summer camps anywhere and that the values that North Star has represented will continue for future generations. Most importantly, it's no longer a hope or a believe. It's now fact. The completed first session was as good or better than any other in our history! Andy's leadership is proven! So, without being over dramatic, corny and completely over the top I can answer with complete and total honesty what's it like to be the ex-owner/ director. Absolutely spectacular!! The satisfaction in knowing that North Star's future is rock solid is extremely gratifying! And with that knowledge I am able to sit back, relax and have a blast watch it all unfold. And better yet, I am sure that your kids are having even more fun than I! A Hot and Fast Start! We knew second session would get off to a scorching start, but who knew that it would bring a 95-degree day! There is really no better day for swim tests, especially with the lake feeling like a bathtub. A strong breeze gave us the relief we needed throughout the day. Everybody was doused in sunscreen and well-hydrated and excited to be in the water to swim. One of the things that I love to see during swim tests is the way that the counselors all jump right in with their kids. No hesitation. They get right in the water and encourage their campers to do their best. And they swim alongside them the whole time. This afternoon, the Junior and Intermediate Villages each played in their own game of continuous dodgeball. 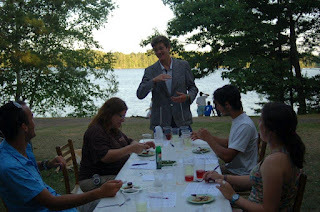 It is a great activity for the first full day, as it is not only a fun activity for all, but a great name game as well. The Senior Village took their guys down to swim point for some Water Polo. The 8-week campers, who had already gone through physicals and swim tests, went on several different day trips. They had the option of going tubing down the Namekagon River, going for a full day of waterskiing and wakeboarding on Round Lake, and going disc golfing at Fiddler's Creek in town. The next display of the staff's enthusiasm happened during our Opening Banquet. The guys decided to dress up and celebrate the arrival of our campers with some good old fashion goofiness. As all of the campers entered the Lodge this evening for dinner, they were again greeted by a crowd of crazy and excited counselors. We have such a great group of campers here this summer, and we are so proud to welcome these guys (back) into the North Star family. 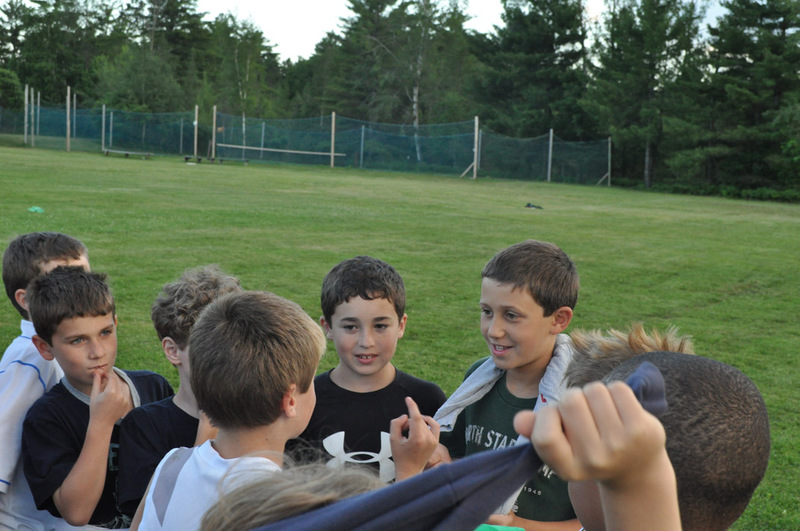 For evening program, we played our first game of All-Camp Capture the Flag of the session! We start by dividing the whole camp into two teams, and then create flag circles on completely opposite ends of camp. We rang a bell and they were off. 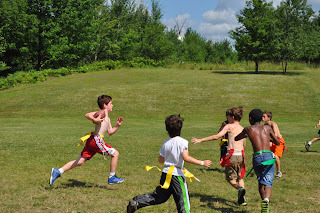 The whole camp was in high-gear in pursuit of the other teams flag. It was a great showdown, with 11-year-old Jonah L. bringing the flag across the line for the game winning point. Second session is officially underway! The buses pulled into camp ahead of schedule to the welcome sight of 85 staff members jumping around like crazy. As we announced cabin assignments around the flagpole, we saw tons of smiling faces as the counselors had their new cabins doing dances and skits in front of the whole camp. We are so proud of our counselors this summer who have again made camp such a warm and caring community. Right as the boys got off the bus, as they all introduced themselves to the campers, it was easy to see both the passion and the skill that these guys have for working with kids. I know the boys will love their counselors. The campers are now unpacking and all of the new campers are getting tours of camp. The staff are running games so that they can all of the campers can learn each others names. At 6:15pm we will have a delicious dinner of hamburgers and fries. The food this summer has been fantastic, and we're looking forward to a great dinner and many more great meals. After dinner, each camper will sign up for his first week of activities. He will get a list of about 100 activities, and, with the guidance of his counselors, he'll narrow it down to six. Tonight each cabin is playing in challenge games with another cabin, which will be followed by our traditional opening candlelight ceremony. As is tradition, the counselors will lead a cabin meeting that includes further introductions, goal-setting and sharing everyone's expectations for the summer. The candlelight ceremony is part of the team-building process at camp, which the counselors continue to develop all summer long. The Cabin Lists are attached. Tomorrow we get right to it. The kids will get checked out by our medical staff, take their swim test, and play several games of continuous dodgeball. The 8-weekers will he headed out on some great day trips. Evening program will be our first game of All-Camp Capture the Flag. And on Tuesday, we'll be right into regular activities. The boys will have their first three instructional periods that they chose tonight. As one of our returning campers said on the bus, "I love camp. The worst thing about camp is that it takes so long for it to come, and when it comes it goes by too fast!" We're looking forward to a great four weeks that will surely fly by. We post pictures online on a regular basis, and starting this summer you will be able to access those from your CampInTouch page. To access your CampInTouch page, go to www.northstarcamp.com and click "login" in the upper right hand corner. From there you can click on "Photos" to see those smiling faces. If you'd like to set up guest accounts for friends or family you can do that from your landing page by clicking on "Guest Accounts." You can also stay informed on Facebook and Twitter. You can read a little bit more about what is going on at camp on North Star Camp's Facebook Fan Page or our Twitter Page. You can even access the pictures via the Facebook page by clicking CampInTouch on the left hand side. We are looking forward to an incredible second session of 2012! The hope of humanity singing, a hymn to a new world in birth. Together fight for victory - a free new world. Together fight for victory, A free new world. This is the opening verse of the March of the United Nations, a song that has been a part of the North Star songbook for decades as part of our celebration of United Nations Day. The day is made even more special with many folks that travel to Wisconsin from around the globe. This year we're glad to have campers and staff from Australia, New Zealand, England, Wales, Ireland, Scotland, Italy, Mexico and Slovakia. Last Sunday marked the start of United Nations Day week at camp, with the selection and announcement of our UN Day captains. Four campers were chosen from each of our three villages, nominated and then elected by the village counselors. This is a difficult task as there are many worthy captains and we ask our staff to select captains who display great sportsmanship, care for their fellow campers and the ability to take on the responsibilities to lead their teams. Each of our captain trios select an adviser to help them. After teams were chosen on Monday, we took a few days off for Cruiser Day and then the 4th of July. Thursday began the action. Each day leading up to UN Day, we practiced one series of events and teams were responsible for coming up with a cheer for lunch announcements. We saw a lot of unique cheers and attempts to parody popular (and not so popular songs). Saturday began 30 minutes early and after our opening ceremonies, the nations of Canada, France, Kazakhstan and Oman opened up competition. The day has four different series, two in the morning and two in the afternoon. We saw some great games in the morning, from great defense on Lou's Diamond (softball) to great marksmanship in riflery. Our mid day scores saw very close competition, with the top three teams within five points of each other. 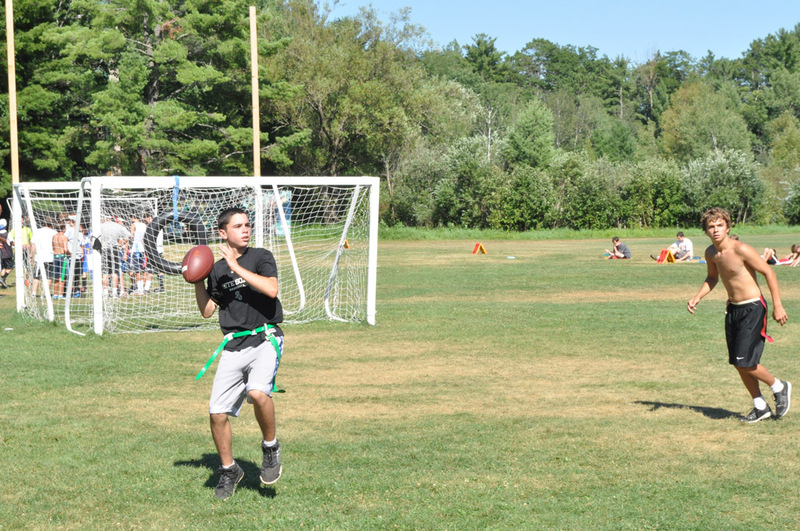 After lunch our staff hit the fields for games of speedball (a combination of soccer, football and basketball). These games count for no overall points, but they mean a lot in terms of both pride and something else. We have a big dinner, and our eating order is based on the results of the games. Before our third series began, the entire camp gathers on the athletic fields. We hold running relays and then camper and staff tug-o-wars. Our afternoon featured more great competition. The standings shifted around throughout the day and as the entire camp gathered at swim point for our final series, there was again only a nine point gap between 1st and 3rd places. 4th series is a great way to end the day, with the final event being our innertube relay. We have our staff advisers lead off the relay for their respective teams! Dinner on UN Day is a big deal. Our kitchen puts a ton of effort into the meal and one of the North Star traditions is that we serve deviled eggs. Following dinner, we gathered for our evening program, which is just reading the scores. You may ask yourself how a simple reading of scores can take an entire evening program. We've perfected the art of the stall here at North Star, and what may usually take about 20 seconds, we're able to stretch into a good hour and 15 minute extravaganza. At the end of the day Oman came away in first, ahead of France by one point. As we say at camp, however, "it just doesn't matter". Lots of fun was had by all as another UN Day is in the books. It has been a great week in the Northwoods. The heat wave that swept across the country brought 90-degree heat for much of the week, and we combated the heat using a combination of sprinklers, slip & slides, our waterfront and a brand new water fountain on the athletic fields. It's hard to believe that an 80-degree day at camp would be welcomed as a cool one! We had a great Independence Day at camp. You could feel the energy in the air right from the start of breakfast. The chants of "USA" and the spontaneous eruption of the Star Spangled Banner kicked off a great day. And amidst the patriotic cheers, we took a moment to talk about why the 4th of July is special at camp. North Star's first summer was in 1945, and with the country at war, one of the main goals of camp was to teach our young men to be great citizens. While I'm sure they never imagined that 68 summers later, we would have campers and counselors from 13 different countries at camp, the Fourth of July continues to signify the importance of being a good citizen of camp, the country you come from and the world we all live in. The morning was our Green-White Marathon. This is a relay race that includes nearly every event in camp. It starts with a running race and includes fun-bugging, swimming, canoeing, climbing, archery, riflery, biking, skipping, tent building, tennis volleying, bed making, basketball shooting, bucket filling, singing, and more, before leading to Boil Water Boil. In this final event, the whole camp gathers around as the two teams compete to build a fire that can boil a tin can full of water over the top first. It was a very close race with the White team making a late comeback during Boil Water Boil to take the lead and win the Marathon. The spirit for Green-White has been fantastic and it has continued to be a close competition all the way through the summer. After lunch, we gave the boys some time to pretty themselves up for our Fourth of July picnic with camp Birch Trail. The ladies of Birch Trails were great hosts, and put on a Hunger Games themed social. Worry not, the campers were not left to fend for themselves with selected weaponry. Our boys were armed only with their wit and their charm! As we got off the buses, we were escorted through the trails where our staff members were kidnapped in the woods to become Tributes for the 2012 Social Games! The Birch Trail staff planned a series of icebreaker games that got all of the campers mingling. After a great barbecue dinner, the music started and there was a great dance party. It was so neat to see our guys dancing carefree, just like they do when we're at North Star, even with the girls around. It was a great Fourth of July! Tonight we wrapped up a great Friday Night Service on attitude. Even through a hot and humid week, our staff and campers kept their spirit and energy up. We had a great sermonette by Andy Rodheim on how quickly a positive attitude can spread at camp, and it really does. Around camp, you see the positive attitudes spreading everywhere. We see it at the activities all the time as our boys take on new challenges over and over until they succeed. 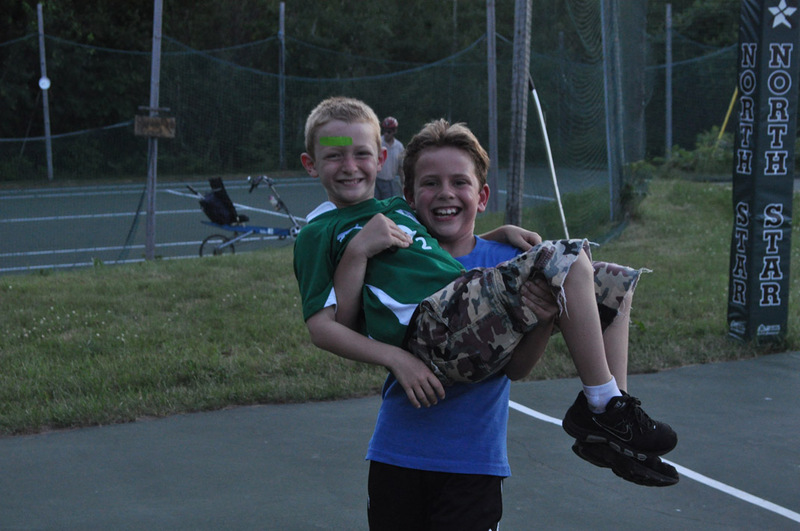 Those great attitudes are just one part of what makes North Star campers the greatest kids in the world! Each summer, the whole camp is divided into two teams for our ongoing Green-White competition. Last night, we kicked off this summers events with our first ever Green-White Series. 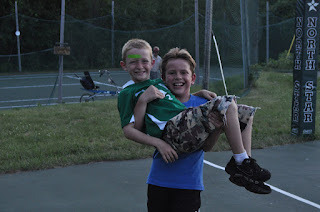 For evening program, the Village Directors planned an evening where each camper would take part in one of a series of events including riflery, soccer, climbing, basketball, tennis, kickball, floor hockey and football. But the games were only part of a great evening. Both teams got dressed in their respective colors and before taking the field, they both prepared a cheer. With us, your teams spirit counts as much as anything. The advisors were painted up and led the camp with great enthusiasm. Also part of the evening was a short discussion of North Star's philosophy on competition. We took some time to reiterate to the boys that while you do play to win the game, it is most important to be a good sport, a good teammate, and to remember that everyone on the field is your friend before, during, and after the game. We talked about being encouraging to both your teammates and to your competition in order to create an environment where everyone can play any game while getting better and having fun. Our staff have done a great job modeling this behavior for our campers and it really showed. The Green-White fun continued 4th period on Monday with activities by village. The Green-White kickoff was a huge success and a great deal of fun. Our first set of trips have now returned. Cabins S-1 and S-2 have each completed the Porcupine Mountain Hiking Trip and Cabin I-4 successfully traversed the Flambeau River. We are very proud of our explorers! In the rest of the world, the weekend brings days off from school and work. At camp, our routine is a little different. While days of rest are hard to come by at camp, Friday nights do bring a change of pace. Every Friday Night, the whole camp gathers at the Council Ring for our Friday Nigh Service. These are values based campfires that involve stories, songs and readings in a beautiful setting (see below). The first one every summer is called the Friendship Fire. We take this first opportunity to recognize the importance of camp friendships. Relationships at camp are different. In a community that strives to be a safe place for kids to truly be themselves, the friendships that form are truly special. We talked about the history of North Star dating back beyond the first summer in 1945. We took a moment to acknowledge camp's founders Lou and Renee Rosenblum and then the Lebby's for ensuring that such an environment exists. And we took a moment to celebrate the kind of relationships the have kept generations of North Star guys to keep coming back. Olly Cayless told a story about what it was about those camp friends that brought him back. And he quoted our own Ben Mizel as saying "North Star is where I can be the best version of myself." Part of the Friendship Fire is appreciating the diversity of our camp community. A representative from each city goes up and throws in a "keylog" to represent the bond of friendship between their city and North Star. Before all is said and done, there are over 100 cities represented by our campers and staff, and it is very neat to hear them all spoken. The weekend not only gives us Friday Night Services, but also two of our favorite traditional meals. Every Friday night we have a traditional dinner of roast beef and potato latkes. Every Saturday night we have a chicken barbeque and Martha's famous cinnamon bread. The food has been fantastic this year, and those weekend dinners are always something to look forward to. Saturday also marked the start of our second set of activities. All of the boys completed their first set of projects on Friday and began a new set of activities today. This afternoon we had a great set of Wacky One Days and we finished off the day with an all-camp game of North Star Ball- our own variation of capture the flag. Cabin I-4 will return tomorrow from their trip on the Flambeau River becoming our first cabin to complete their camping trip this year. And I-3 will embark on their trip in the morning. It has been a great first week and this weekend has been the icing on the cake! One of our goals at camp is to get campers active. While we have to spend our first full day doing things like swim tests and camper physicals, we make sure that everyone is active, playing games like continuous dodgeball and all camp capture the flag. We jump right into the full program on day two. The first night that our campers arrive they complete their activity requests, and less than 36 hours later, they're on the program climbing, waterskiing and playing. Day one of the activities was great. Inclement weather held off and we were able to get in a full morning of activities. We did have to go into a rainy day program in the afternoon, but we took advantage of that time to make sure all campers learned the basic North Star games like spoons, euchre and mafia. The evening was our staff introductory talent show. At North Star talent is pretty loosely defined, but our campers were more than a little bit entertained by skits, songs and other random performances. Today the sun was out and with the second day of our full program, our campers really start getting into a groove. Things become routine for new campers and everyone starts progressing on their first set of activities. Its so much fun to see a camper get up on skis for the first time or actually hit the target down on archery. Our evening program was a great night of field games, organized by several of our counselors. Camp was split into four groups and everyone rotated amongst four different games. For our campers, the games were just fun, but many of them had a deeper purpose. My favorite one was Alaskan Baseball, where two teams were pretty much running all over the field, but in the meantime, they were learning names of everyone else on their side. Over the last two days our staff has really helped get the summer off to a successful start. Organizing great evening activities is just the start. Making sure that campers are engaged and having fun on a rainy day can be challenging. Our counselors really stepped up! To say that we're proud and impressed with our staff is an understatement. We also have four cabin groups out on trips. Our Pine and Manor cabins left yesterday bright and early for the Canadian wilderness. They hit the lakes of Quetico Provincial Park this morning. Cabins S-1 and S-2 left today for the Porcupine Mountains in the upper peninsula of Michigan. The trips will continue with I-4 heading out on the Flambeau River tomorrow. Our first full day at camp was just that - Full! The rainy skies cleared up after breakfast and allowed us all the time we needed for physicals, swim tests, and the all-important games of Continuous Dodgeball. This game has truly become a staple of the first day at camp, where a whole village is out on the athletic fields playing an every-man-for-themselves version of dodgeball. The twist on the first day is that when you get somebody out, you have to go introduce yourself to that person. Between the candlelight ceremonies that took place last night, and the various activities throughout the day, this helped facilitate an environment whereby all the of the campers know the names of their fellow campers. Continuous Dodgeball is more than just a technique for introductions. It is also an opportunity for the energy of the North Star community to be on full display. Campers and counselors alike were out there having a blast while trying their hardest and demonstrating great sportsmanship. Matty N, one of our J-1 counselors, came to play as "Captain Underpants" to encourage the campers to bring their enthusiasm. And it worked. The next outlet for our staff's creativity came in the form of our Opening Banquet. The guys decided to dress up and celebrate the arrival of our campers with some good old fashion goofiness. As all of the campers entered the Lodge this evening for dinner, they were again greeted by a crowd of crazy and excited counselors. We have such a great group of campers here this summer, and we are so proud to welcome these guys (back) into the North Star family. For evening program, we played our first game of All-Camp Capture the Flag! We start by dividing the whole camp into two teams, and then create flag circles on completely opposite ends of camp. We rang a bell and they were off. The whole camp was in high-gear in pursuit of the other teams flag. It was a great showdown, with 11-year-old Clarence W. bringing the flag across the line for the game winning point. While the night was through then for most of our boys, our oldest group was preparing to leave for Canada. Tomorrow morning, they will take off on their 10-day journey through Quetico Provincial Park in Ontario. They did some training today along with packing, and the group also gathered at Leb and Sue's house for a proper send-off. We talked about the significance of the trip and previewed just how much fun these guys are going to have. We're so excited for them and can't wait to hear the stories when they get back! The Summer of 2012 has officially begun! A full year's worth of preparations have led to today, and it still exceeded expectations. From the time we gathered in Chicago and the first flights arrived to Minneapolis, you could feel the excitement. There were a lot of boys running to the buses with big smiles on their faces, thrilled to meet new friends and old. It was great to see the returning campers sharing their favorite parts of camp with the new guys, and making sure they were excited to get to their "home away from home." We pulled into camp to see the counselors jumping for joy. The staff have been arriving since late May and have been working hard to prepare the grounds, get trained in their specific activities areas, and, most importantly, to learn as much as possible in order to take great care of each of your sons. And they have done a great job. We have our highest number of returning staff in many years, and the new staff is a mature, compassionate and talented group that has fit in seamlessly. I am very proud of the staff that we have put together, and I know the boys are going to love them. We gathered around the flagpole, and as we announced the cabins, the staff and campers went crazy. High fives, chest bumps and prepared shenanigans put a smile on everybody's face. The kids have now unpacked and new campers have been given a tour of camp. By the time they go to sleep tonight, they'll have played games with their cabins and met some of the other guys their age as well. Dinner this evening will be burgers, fries, jello, salad and the ever present peanut butter and jelly. There will be vegetarian burgers available for those that prefer, and brownies for dessert. The food thus far has been amazing. Chefs Paddi and Briana, and our whole kitchen staff have quickly become camps most cheered camp celebrities. 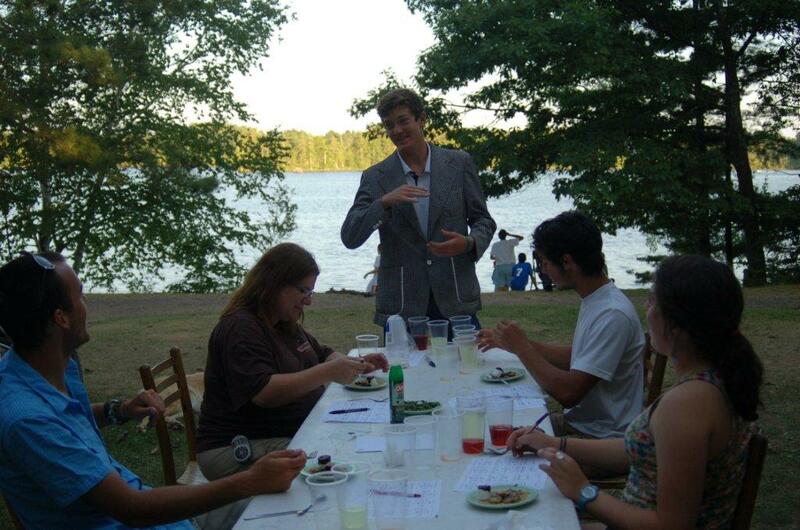 Immediately following dinner, the campers will choose their first week's activities. Their counselors will be encouraging them not only to participate in the activities that they are already familiar with, but also to try out some new ones as well. The evening activities will be followed by the candlelight ceremonies, where each cabin will have a meeting led by their counselors. They will share their goals and expectations for the summer, while continuing to get to know one another. This will be the first of many cabin discussions that are an important part of the "team" building goals that we have for each cabin group, and helps develop the strong sense of community that we strive for at camp. Tomorrow the kids will have a busy day as they get checked out by the medical staff, take a swim test and find time to play several games of dodgeball. Evening program tomorrow will be our first game of All-Camp Capture the Flag. First thing on Wednesday morning the boys will begin their first week of regular activities. Wednesday morning our oldest campers will leave for their Canadian adventure, where they will spend 10 days in the Canadian wilderness in Quetico Provincial Park. Wednesday evening will be the staff show, where our very talented group will be on display. Throughout the summer, we'll be keeping you up to date by posting on our website at www.northstarcamp.com. 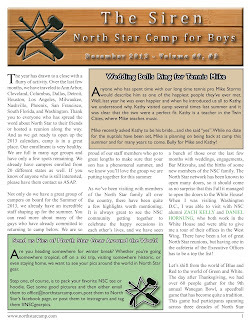 The news updates can be found on "Leb's Ramblings," (same name, new author) at www.northstarcamp.com/blog. It can also be found in the Media Room, which is in the Current Families section of the website. We will be utilizing Facebook and Twitter to let families know when there are new blog entries, summer pictures posted and other news bits. 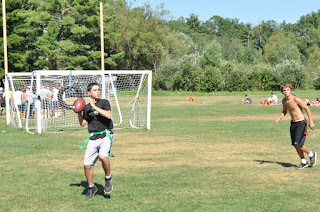 You can follow North Star on Facebook at facebook.com/northstarcampforboys and you can follow us on Twitter at twitter.com/northstarcamp..
We post pictures online on a regular basis, and you can access those directly from your CampInTouch page. To access your CampInTouch page, go to www.northstarcamp.com and click "login" in the upper right hand corner. From there you can click on "Photos" to see those smiling faces. If you'd like to set up guest accounts for friends or family you can do that from your landing page by clicking on "Guest Accounts." It is going to be a great summer!